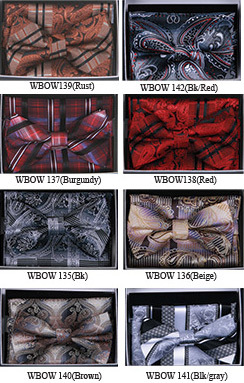 Fancy pattern bow tie sets are what you'll see plenty of trendy well dressed men wearing with their suits these days. The Bow tie style has come back in a big way and Contempo Suits has plenty to choose from. These mens bow tie sets come with a big adjustable bow tie and the matching silk hanky ready to make Your look complete.